One of the most sought-after poses in today’s society, Handstand or Vinyasa Asana can be considered as a true demonstration of grace, finesse, and strength. While immense upper body strength is required in order to perform this pose, those of us who have mastered the ability to walk in the pose are revered by fellow mates, teachers, and loved ones. An inward journey, this advanced and intense yoga pose allows the practitioner to get accustomed to their own body language. Many yogis also refer to this pose as Adho Mukha Vrksasana, where ‘Adho’ translates to ‘Downward’, ‘Mukha’ means ‘Face’, ‘Vriksha’ means ‘Tree’, and ‘Asana’ means ‘Pose’. Let us understand a step-by-step procedure to stand on our hands and experience a gush of blood flowing downwards. We would also discuss Vinyasa Asana modifications, benefits, and contraindications. Step 1: Bring the mat closer to the wall and come in Adho Mukha Svanasana or the Downward Dog Pose with the face towards the wall. The hands are placed just a few inches away from the wall in order to gain support (late on) if needed. The hands are parallel and in line with each other while the fingers are spread out to get extra grip and stability. Step 2: Before entering the pose, prepare the shoulders by drawing them away from the ears. Firm the shoulder blades and elongate the spine. Rotate the upper arms outward and ensure the elbows are stretched out. Step 4: Keep the lower back steady and straight and at no point should it be swayed or abnormally arched because this can lead to an injury. In order to keep the lower back straight, draw the front of the ribs into the torso, elongate the tailbone like it is being pulled from the heels, squeeze the outer legs with each other and roll the thighs in. Step 5: The head will rest in between the hands and will be in line with the shoulders. In order to step out of the Vinyasa Asana, gently bring one leg back and follow the other leg back to the mat just like you launched yourself. The shoulders will gracefully sync back into their place. Beginners can start by placing the feet on the wall and ensure that they don’t hang the feet directly, bringing them in the air. They can bring one foot in the air, while the other rests on the wall and alternate to gradually bring both of them in the air together. Many people also use head stabilizers in Vinyasa Asana by placing a padded cushion or pillow on the mat in between the hands. The head is slightly rested n this support which works as a great confidence booster. Try to start practicing the Plank Pose, Downward Dog Pose, Crow Pose, Peacock Pose, etc., which will work as preparatory poses for Handstand. One of the obvious benefits of performing Vinyasa Asana is that it strengthens and tones the upper body. It sculpts and shapes the muscles of the arms namely; biceps, triceps, and also works on the chest and the back. It strengthens the bone, thereby improving the musculoskeletal health of the upper body. An inversion, this pose is great for the heart as it brings the heart lower than the lower body which gives the heart some rest. The inverted motion of blood to the face also relieves stress, tension, insomnia, and facial skin conditions. It develops strength and tone of the core as the core works majorly to bring a balance and keep the body steady in the air. Practitioners with a strong core will find it easier to perform this pose. 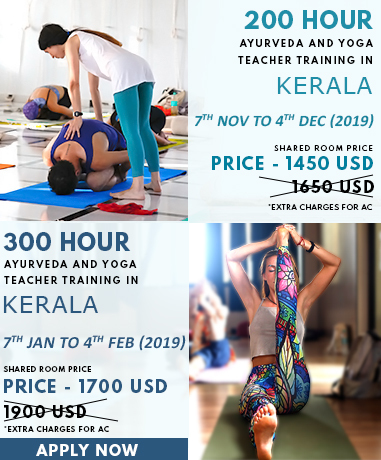 To know more about Vinyasa in further details, explore our Yoga Teacher Training In India.